Railroad speeds have been a subject of intense competition ever since Richard Trevithick first had a high-pressure steam engine mounted on a set of rail wheels to make a locomotive. Designers, railroad companies and national governments have duked it out over who has the quickest trains. Though the results often have little bearing on the everyday trains that shuttle commuters into work, it continues to be a source of fierce competition. At the time of writing this piece the fastest conventional train record is held by the French and the fastest in timetabled service is located in China, but it’s certain that engineers from multiple other countries have those records in their sights. In the 1960s while French and Japanese engineers were busy making the fastest trains of the age using electric power from overhead wires, the president of an American railroad company had other ideas. The New York Central Railroad would create a train that would run at 200 mph, and it would do so using jet power. The engineer tasked with making this idea a reality was [Don Wetzel]. 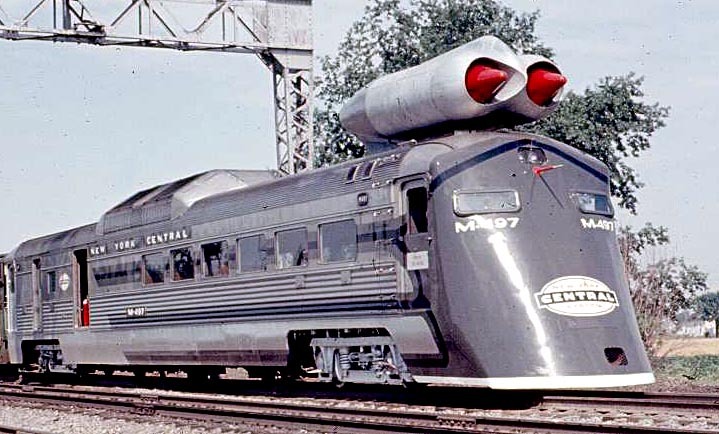 He took an existing diesel-powered railcar and mounted the booster nacelle from a Convair B36 bomber on a pylon above its cab, with its General Electric J47 engines providing the power. The Convair nacelle was mounted upside down, having previously been slung under the wing of the aircraft, so the engines had to be turned through 180 degrees within it. A streamlined front was fitted to the railcar, resulting in its being nicknamed the “Black Beetle“. A 21-mile stretch of track was chosen between Butler, Indiana, and Stryker, Ohio, for its level grade and lack of corners. His top speed was 196 mph, but as he says in the first of the videos further down this page he was going easy on the throttle as the aim of the run was for 180 mph . If he had known that the world record at the time held by the French was a little over 200 mph, he might have opened it up a bit more. As it was his record still stands as the fastest achieved by a train carrying its own power source rather than taking its power from an overhead wire. At the height of the Cold War, if one superpower did something then the other seemed bound to follow suit. 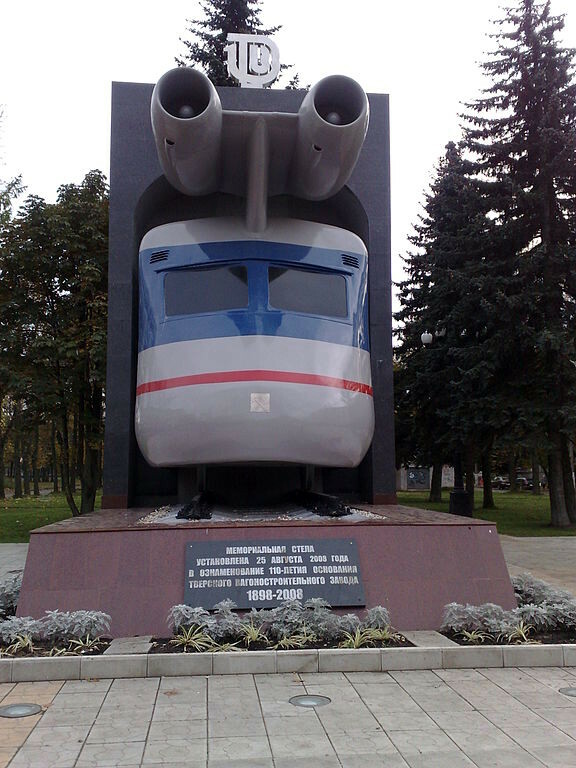 A few years later in the early 1970s, the Russian railways also experimented with a jet-powered train (Google translation of a Russian Wikipedia original). Like the Black Beetle, they used an existing railcar modified with a streamlined front and a pair of jet engines above its cab, but unlike the American train they also streamlined the rear of the car. The engines were Ivchenko AI-25 units as used in Yakovlev Yak-40 regional airliners. It achieved a 250 kmh speed on its test track between Dnipropetrovsk and Novomoskovsk in modern-day Ukraine. 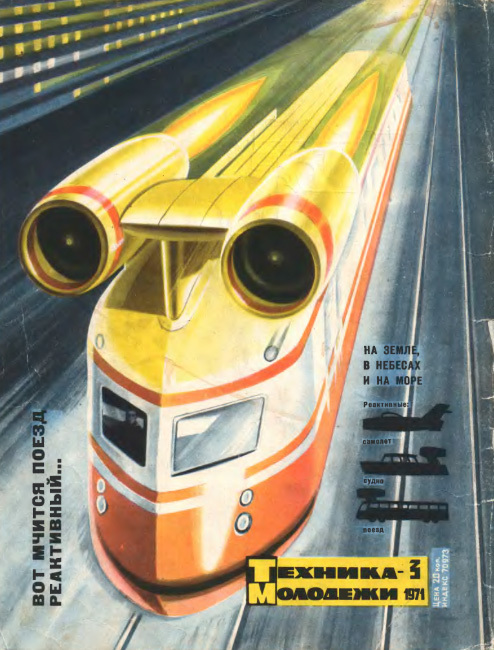 Both the American and Soviet jet-powered trains were never intended as passenger-carrying transport, instead they served as engineering test beds to gather data about the effects of high-speed on both rolling stock and track. In that aim they succeeded, as the Russian engineer speaking in the second of the videos below testifies. What is remarkable is that neither train was built as a high-speed research vehicle from the ground up, both used run-of-the-mill low-speed railcars as their basis and ran on normal in-service track rather than specially prepared high-speed test tracks. Their operators should in both cases be remembered as particularly brave engineers, willing to risk a fatal rail crash in hardware pushed very far beyond the speeds it was designed for. The Russian train survived until recently in the derelict state pictured in the page linked at the top of this page, but the American one had its jet engines and streamlining removed and was returned to regular service, eventually being scrapped in the early 1980s. In the first video below the break courtesy of General Electric, [Wetzel] gives a fascinating personal account of the development of the Black Beetle, and of its record-breaking run. The second video of a Russia Today report mentions both trains, and has some film of the Russian train in operation. Unsurprisingly, no jet-powered trains have been produced by our wider community of hackers and makers, so these are the first to feature on these pages. We have however featured more than one home-made jet engine. I’m thinking one of those garden railroad (the ride-on kind) engines with a JATO on top. It would either be without operator seating, or the seat could be elevated just above the JATO for particularly foolhardy engineers. The second option might just be a new candidate for a Darwin Award, depending on particulars. IIRC, AMTRAK had a turbine powered passenger train they toured the country with in the early ’70’s. A number of years ago a dragster pickup with a couple of jet engines powered by diesel fuel was travelling the air show circuit. Union pacific had a fairly large fleet of gas turbine-electric locomotives in the 50s and 60s. Union Pacific had at least three types of turboshaft type gas turbine powered locomotives, but that depends on how you count them. They were only economical because they were able to run on what amounted to the waste products of crude oil cracking & distillation. As that process became more efficient and other uses were found for the waste, the economics were squeezed out. They were prevented from operating in cities because of their noise, which I suspect most “jet” projects would have been limited. I think a few other large US railroads had gas turbine locomotives but not as many and didn’t serve as long. France’s TGV design was originally gas turbine powered but economics squeezed that one out, so it became all-electric for actual service. “sadly abandoned”? I would like to see a side by side efficiency for this thing versus a diesel-electric — uphill. Two types of turbine powered passenger trains operated in regular service in the US, the UAC TurboTrain, and the RTG/RTL Turboliners. Both worked reasonably well in service, but their unique designs apparently led to higher maintenance costs, and Amtrak phased both types out of service in short order. CN in Canada operated the UAC model on the Montreal-Toronto corridor under the name: The Turbo in the late Sixties. The main line ran past the top of my street and more often than not you would see the poor Turbo being hauled by a diesel locomotive. It had nothing but problems. Were they turbine driven, or turbine/electric? I’m sure they were not like this rocket powered train. Which, at least was pretty, compared to the black beetle. The classic reply to that is that almost every train in France is nuclear-powered, as most of their rail network is electrified, and most of their electric power comes from nuclear. Nuclear reactor, bar, pool, bowling alley, but no jet engines. This looks like something Colin Furze would do by strapping a pulse jet engine to a amusement park train. You’re trying to dare Colin, aren’t you? What’s the reason for the preferred mounting position of a jet engine “the right way up”? Lubrication systems protesting? I’m referring to that the jet motors themselves had to be inverted after their nacelles were used up side down.